So for 30 days (actually 6 weeks) with the support of fellow participants, participants experiment with themselves. I want you to see yourself like never before! See who you are and who you continue to be! 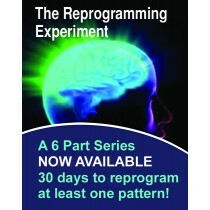 The reprogramming process is much more than simply focusing on what you desire. This is clear otherwise our lives would be interpreted and experienced in a seemingly less complex manner. Are you even aware of the life you are living and how you have come to live it? The science of our moment to moment function and the subtlety of the authorized shaping of our lives is key to this reprogramming experiment with one's self. So my intention is to share insights and tools that will trigger your master self and to remind you that there is a way beyond any sense of feeling stuck. Through this 30 day journey, my desire is for you to more clearly see the power you possess over your life and your choices.